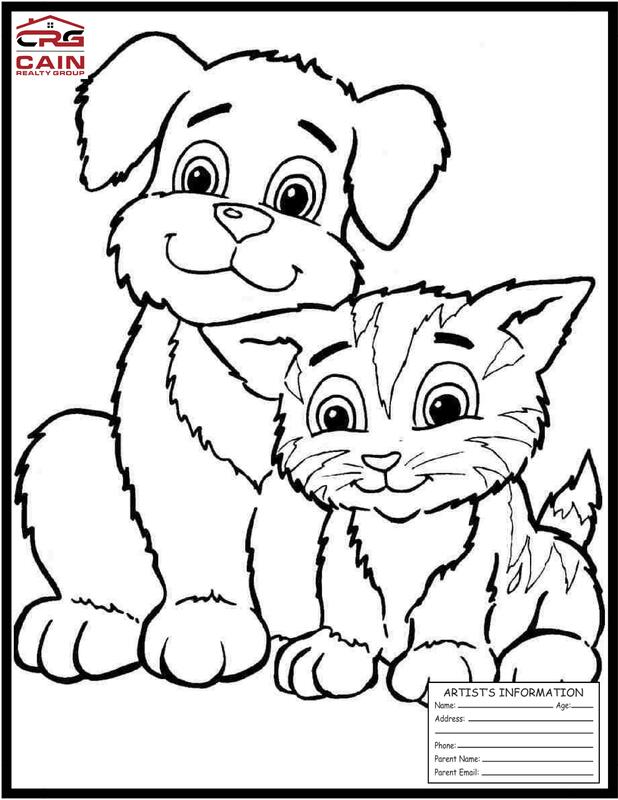 Print out and color for a chance to win! Mail your final version to us and we will announce the winner at the end of the month! Cain Realty Group is proud to have sponsored the Annual Travis Country Fourth of July Parade this past week. The parade kicked off at 9:00 a.m. with streets lined of red, white and blue! The parade included refreshments, patriotic tattoos, balloon animals, an epic water balloon fight, and a Kona Ice Snow Cone truck donated by The Cain Team. It was a very patriotic event enjoyed by all TC residents who attended! The parade also included a little friendly competition for the following categories, congratulations to all winners! We look forward to seeing you all again next year! Travis Country 4th of July Parade 2018 from Cain Realty Group on Vimeo. Join us this Wednesday, July 4th from 9-11AM for the Annual Travis Country 4th of July parade! 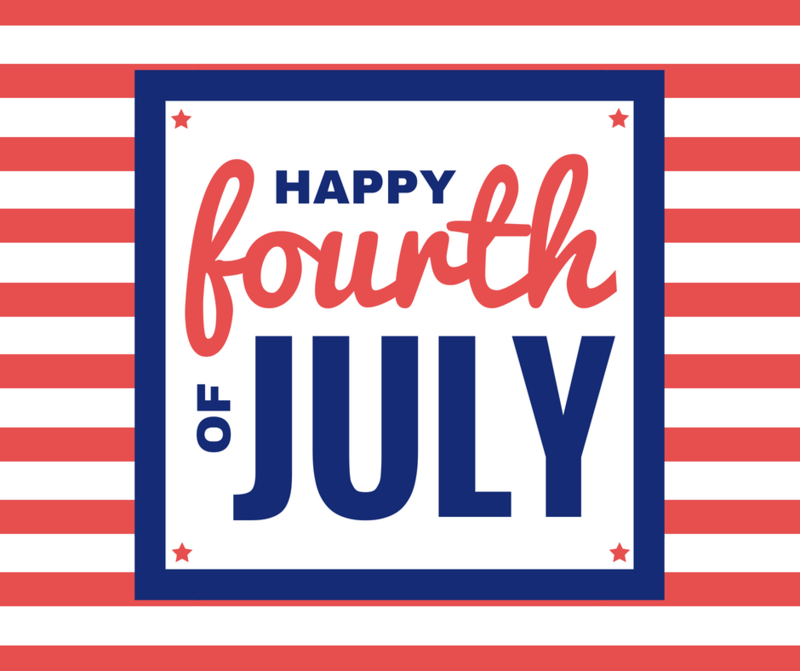 Put on your best red, white and blue and come out and join your neighbors in celebrating our great country with a neighborhood parade! Decorate your floats, classic cars, bikes, strollers, and wagons and join the parade. We'd love to see blocks in the neighborhood work on "block floats" to have at the parade! So, get started now to have something red, white, and fabulous ready by the 4th! You just might win a prize for the effort!! Kids, Pets, Musicians, Everyone - WELCOME! Winners will be announced at the stand after the parade. We look forward to seeing you there, let's celebrate the Land of the Free! It's that time again for our 8th annual Cain Team 4th of July Apple Pie Giveaway! Nothing tastes better than apple pie on the 4th of July! To reserve your delicious apple pie for pickup Monday, July 2nd, CLICK HERE. We will take registrations until the morning of Friday, June 29th, so please hop on ASAP to sign up for some apple goodness! We are also giving away Cain Keys to go towards free prizes that can be redeemed at CainClub.com just for coming to pick up your pie. Here is a link to our office location. If your plans change after registering for an apple pie, please let us know. The team can only personally eat so many apple pies! Join us for a Travis Country Open House This Saturday! 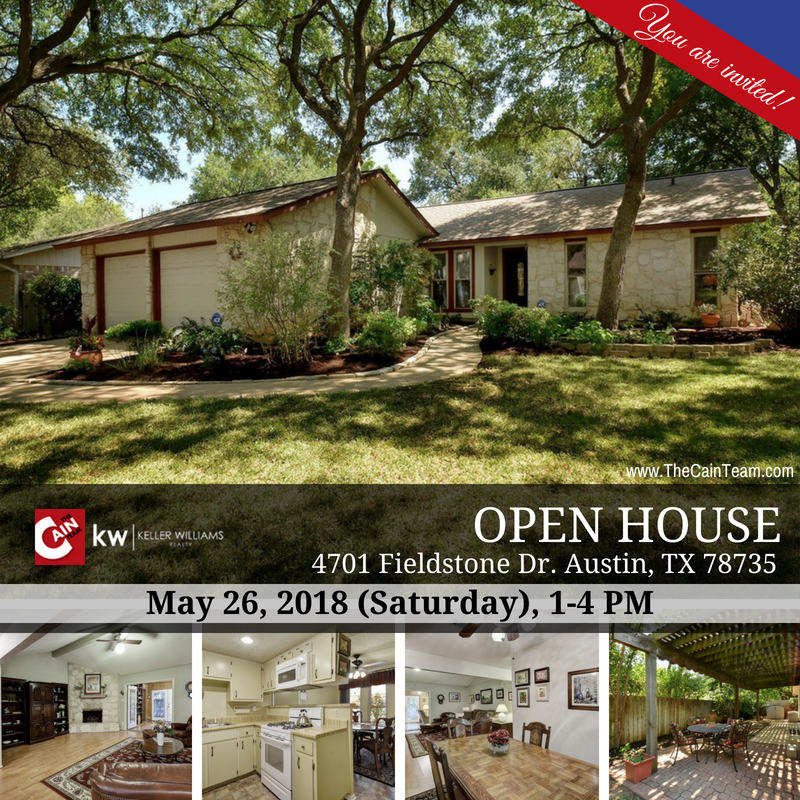 Join us this Saturday, May 26th, from 1-4 PM for an amazing Travis Country Open House! This charming home is located on a quiet tree-lined street. Light & bright throughout featuring high ceilings, French doors, laminate wood flooring, fresh paint & ceiling fans in every room. Recent updates include HVAC, roof and triple pane windows! Private & spacious backyard with a pergola for entertaining. Walk to Barton Creek Greenbelt, only mins to DT Austin & award-winning schools! April showers bring May flowers...and events! It is time to get out and enjoy time with the family this month, and we've got you covered. 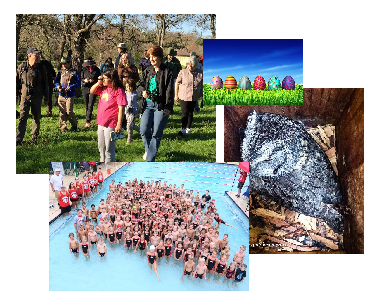 Enjoy this month's events and activities blog for fun family-friendly activities. 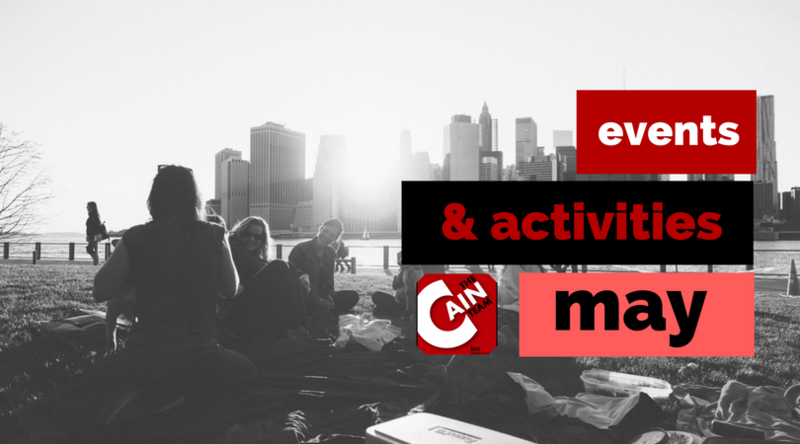 As always, tag us in your Facebook photos at our referred events for Cain Club points. We've got some amazing prizes with your name on it! Grab chairs and a blanket, bring family and friends and enjoy this special screening of the Greatest Showman. Come as early as 7:30 pm to explore Community First! Village, pick your spot and enjoy your favorite movie snacks from the Community Grille. Burgers, french fries, snacks, and drinks will be available for purchase (cards and cash accepted!). The event is free, however, a $5 donation would be highly appreciated. Donations can be made electronically when RSVPing to this event. KINDNESSPALOOZA, a free family-friendly event, will be held in the Central Plaza by the Splash Pad on Saturday, May 5th from 12:00 - 4:00 pm. The Mrs band, an all-female pop rock band with a positive message, will be headlining the event. Teen music sensation Madison McWilliams is also performing along with other musical guests, including SaulPaul, Big Don and Courtney Santana. A HUGE thank you to all our amazing Travis Country neighbors who came out and made the Easter Bash a success! Thousands of eggs were hunted, beautiful crafts crafted, and of course, the petting zoo and pony rides were a fan favorite. We enjoy celebrating with you and hope you enjoyed it as much as we did! Check out the video below for a recap of the amazing event, we hope you see you all next year! Don't miss the Travis Country Easter Bash this Saturday! It's that time of year again! It's time for the Travis Country Easter Bash! We are excited to sponsor the petting zoo again this year and look forward to a day full of fun and celebration! The Easter Bash is one of our favorite Travis Country Events as we love getting to spend time with our TC neighbors. We'll see you there! As you may or may not know, a "Big Why" behind why the team and I are passionate about selling homes is the opportunity to greater fund our mission of serving our clients, past clients, and community in times of severe need. 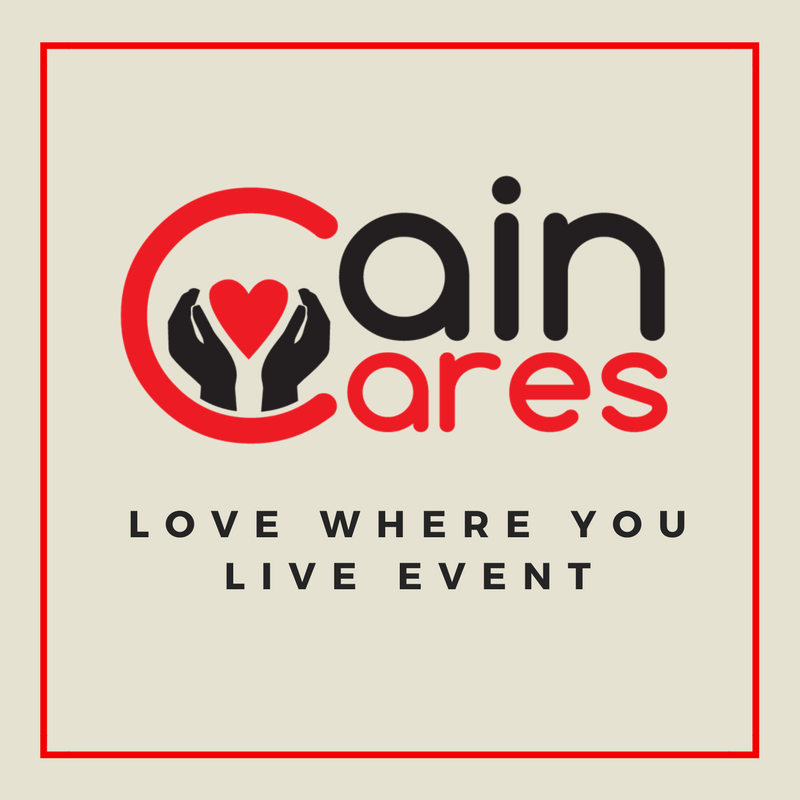 We do this through funding our non-profit, Cain Cares, after every home sale. We have chosen to stay "home" for our first community outreach event. I'm asking for your assistance in helping me to identify someone or a family in our neighborhood that may be in a severe time of need and/or may be barely scraping by. As a result, perhaps their house is in disarray. Many of us have been through tough times in our life, God knows my family and I have. We'd like to identify this person or family, and spend an entire day at their house and help to improve their property. This will depend on the property of course, yet this could include items such as landscaping/yard work, painting, flooring, cleaning, light remodeling, etc. We will have the entire team helping, as well as our trusted vendors that are applicable to what the need would be. We will be doing this event April 7th, yet we are looking to identify some candidates sooner than later. I'd be extremely grateful if you'd take some time to think about who could be impacted by our mission. If you can share this on any applicable social media channels, that too would be appreciated. Please see click here to nominate someone you know of or share with them directly and let them nominate themselves. Join the Travis Country Social Committee and HOA this Saturday, March 3rd from 6:00 PM to 10:00 PM for the Spring Movie Night! Come help us kick off Spring with TC Movies in the Park! - FREE Movie style popcorn, double feature, pizza, and drinks (water, Capri Suns, and sodas) generously - provided by the TC Social Committee and Travis Country HOA. - DINNER: Pizza will be available for free starting at 6pm or you can bring your own picnic. Friends and family, young and old - you are all invited to this fun free event! Please invite all your neighbors and RSVP so we can get a good guess at attendance for the night. Be sure to bring chairs and possibly blankets to spread out on the Hilltop parking lot. Santa Clause is Coming to Travis Country! Hello, neighbor! It’s almost the most wonderful time of the year! Come celebrate the holidays with the Cain Team at our Annual Holiday in the Park event December 2nd from 12pm-5pm at the Travis Country HOA building located at 4504 Travis Country Circle. Santa is coming to Travis Country and he is ready to spread Christmas cheer! Avoid the chaos of the mall, bring your kiddos to take photos with Santa, enjoy yummy snacks and complete crafts and activities at Santa’s workshop! Pets are also welcome for photos with Santa, the reindeers have promised to share their treats! We look forward to seeing you and your family for a day full of Christmas glee! Join us for an Open House in Travis Country this Saturday, November 18th from 1-4 PM! Spacious two-story estate on an over-sized lot in Travis Country! The master leads to the backyard and contains a large soaking tub and a separate walk-in shower. The open floor plan allows for easy interactions between the kitchen, living area, and dining room. Bonus rooms have the ability to be turned into a game room or at-home office. The detached garage has the capacity for up to 3 cars. The community has amazing amenities, is situated next to Barton Creek greenbelt and award-winning schools! Travis Country Halloween Movie Night! The TC Social Committee is hosting a Halloween Movie night in Travis Country Circle!! Come enjoy some Halloween spirit with a holiday classic and spooky cartoon for kids of all ages and then stay for a fun full-length movie! FREE Snacks and drinks starting at 7 p.m.
Be sure to bring blankets and possibly chairs (especially the short river chairs so you don't obstruct folks' views behind you) to spread out on the lawn behind the TC Office, outside the fence by the dive pool. Time to clean out the old to make way for the new! The Travis Country Community Garage Sale is scheduled for Saturday and Sunday, September 23 and 24th, starting at 8:00 AM. There will be an ad in the newspaper, TC Notes, as well as various social media outlets. The sale will have no set times and no registration is required for participation. See you there! You may also visit the Travis Country community official Facebook page here. Please RSVP online so we can make sure we have enough food and eggs by clicking on this link. We also need volunteers to make this event more successful. Think you can lend a hand with egg stuffing and/or hiding them for our kiddos to find? Sign up here or send a message to social@traviscountry.com for more information. The first bird walk of 2017 was a huge success, so make sure to join the next one on Saturday, April 8. Meeting place is at the Travis Country Office, so come equipped and comfortable before 7:30 a.m. 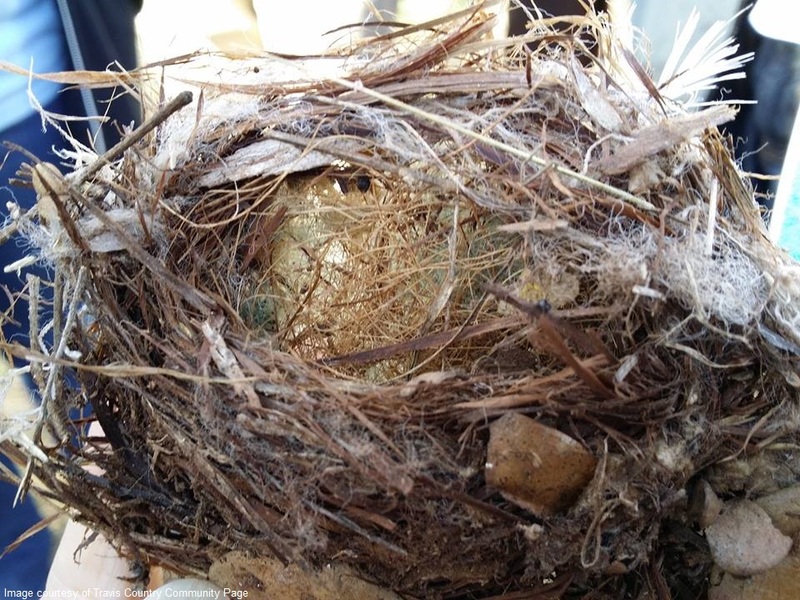 Since the birds are nesting and active, spring is officially here, and the weather forecast is good, the second successful Travis Country Bird Walk will soon be underway! The registration for the Travis Country Sharks is currently ongoing. The summer swim team is a good opportunity for residents aged 5 to 18 to make friends and acquire necessary swimming skills. To learn more about the local team and register, please click here. We need volunteers! our TC Easter Bash has always been a success, and we want to keep it that way! Got some free time on your hands? Please help us out and sign up for a shift next Saturday, April 15, 2017, 7:30-11 a.m. We're using SignUp to organize the volunteers for the event, so all you have to do is click here to get logged into the volunteer group, choose what you'd like to do to help, and that's it! No registration required. Plans for succeeding bird walks are underway and announcements will be made at Travis Country's official Facebook page and the Travis Country Online website, so stay tuned! Join us as we kick off this year's Bird Walk season for 2017! 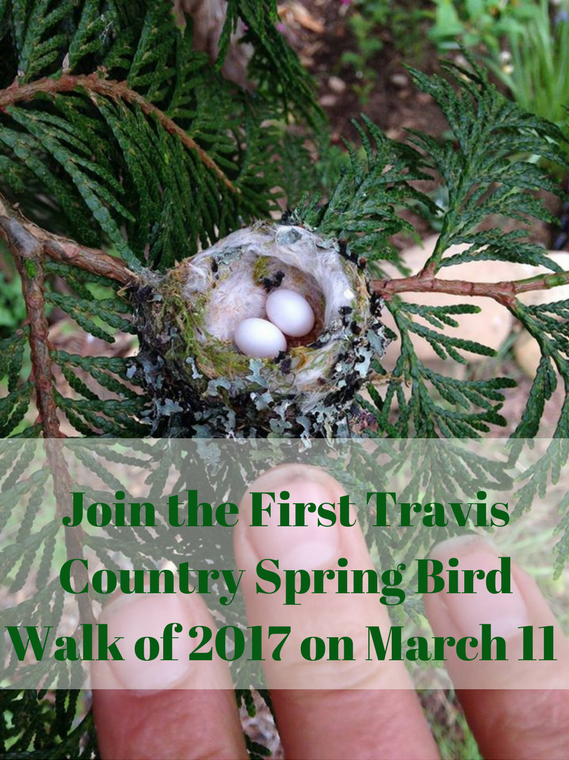 We will be having this year's Travis Country Spring Bird Walk on Saturday, March 11. Attendees are required to be at the Blue Valley office by 7:30 a.m. sharp. Weather forecasts in the area appear to be rainy, but the BIrd Walk will push through regardless, except if it rains on Saturday, 7:30 a.m. If it rains the night before, attendees are encouraged to come join the fun with their fun rubber boots on! This is the perfect time to bond with family and friends as we appreciate the beauty of our community and its exquisite scenery and wildlife. See you there! For more information about this event, you may access the official Facebook page managed by the Travis Country HOA.